Don’t miss this vibrant and fun wine tasting event. Located in the heart of the West Seattle Junction, go to 15 shops and meet 15 winemakers! Grab some friends and go on a wine tasting adventure of local wineries at downtown Kirkland businesses. 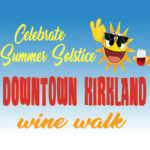 Meet the winemakers from 18 wineries and sip, shop, stroll, and sip some more thru scenic Downtown Kirkland, a vibrant waterfront destination ! !